Still hot. Still really, really hot. 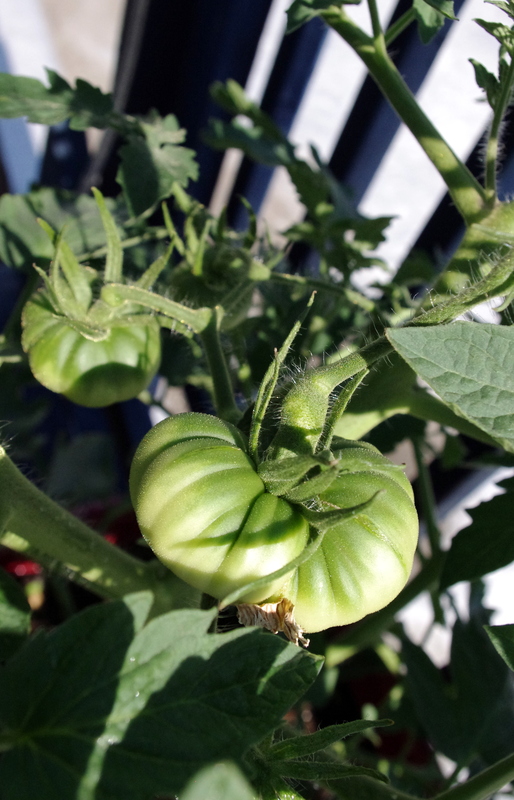 In a perhaps vain attempt to maintain an tomato and cucumber harvest (with weeks of 90+ temps, it’s unlikely, isn’t it? ), every plant that can be moved into shadier bits of the little blue deck has been. And now? POD”s minder, endurer, and littlest deckhand/hindrance are outta’ here. The shore’s calling. For the day, at least. 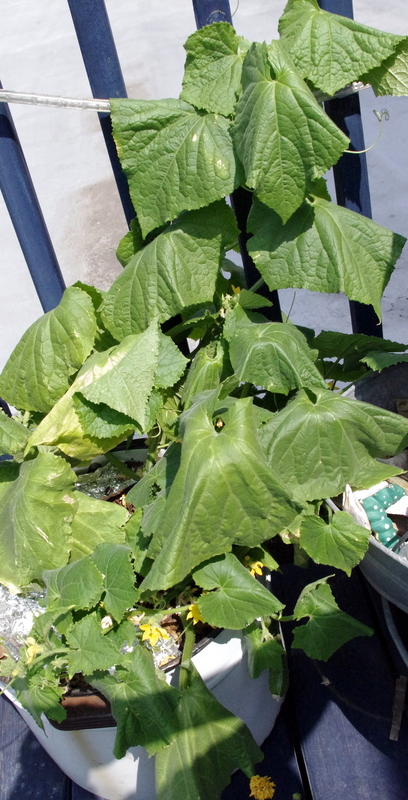 Even if the heat decides to wreak its havoc on the little blue deck, it’s been a good cucumber year, as you can see. Harvest cucumbers early in the morning, before they’ve been over-warmed by the sweltering sun. Refrigerate immediately. Happily, they seem to survive storage for at least a week. Tend to your cucurbits daily — leaving just one cucumber on the vine (they’re sneaky, so look closely) will halt production. “I’m glad to hear that you are seeing fruit on your plants, so things must be improving somewhat. In regards to the 8 lb potting soil, I have performed basic testing on a sample pulled from our current inventory. What I found is that the pH range was running 7.2 to 7.9 which is higher than what most vegetable prefer. This in combination with finding salt levels ranging from 2.52 to 3.22 is likely where your issues rest. [This company] would never use herbicides that would prolong in the raw materials and cause the symptoms that were viewed in your attachment. 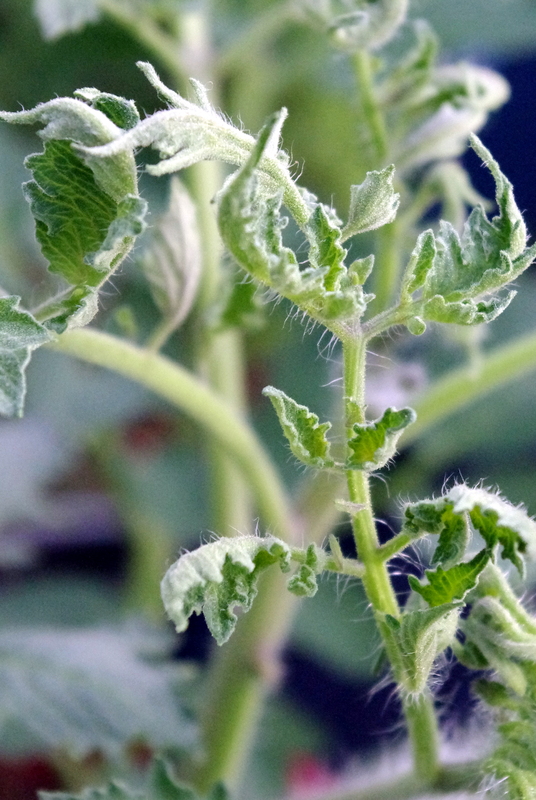 The plant response you are experiencing is likely due to nutrient imbalance and high pH and salt levels. I have kept our office informed of my test results on the 8 lb potting soil and will make a final recommendation once a full nutrient analysis is completed at a commercial laboratory. That testing will take about a week to see back results. At that time I will forward those findings to you for your review. Soooooo, if your soil runs a pH too high for veggies, why are veggies pictured on the bag? And high sodium levels? That’s bad news. So yeah, that could mess things up. 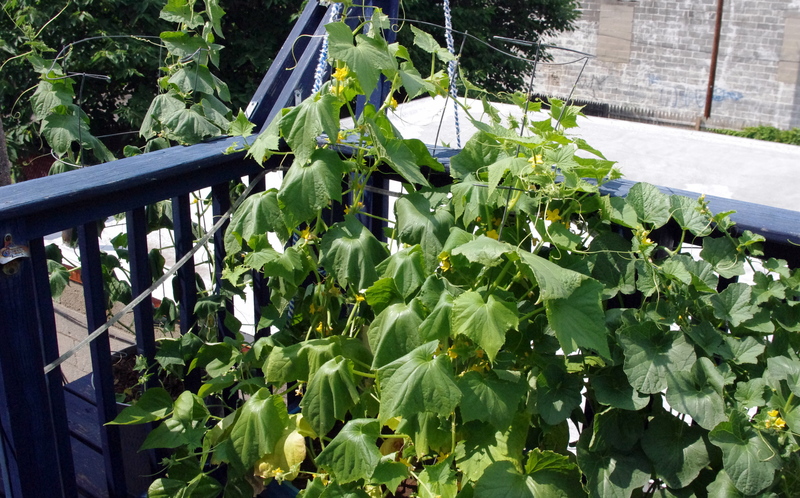 …POD was lamenting the aphid infestation that wiped out the cucumbers and melons. And the looper infestation, that wiped out the chard. And the whitefly infestation that wiped out the tomatoes. And, well, you get the picture. 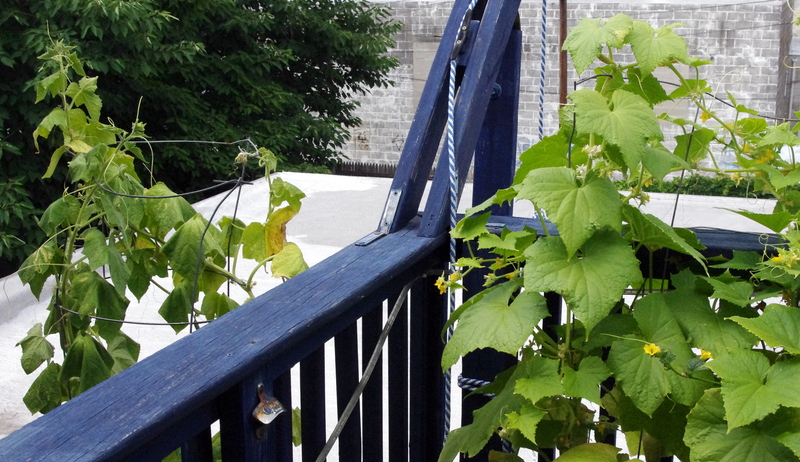 This year, knock on the little blue deck, hasn’t been half bad, pest-wise. But now there’s this heatwave thing. And this whole lack of rain thing. And the whole taking off for a long weekend with 100+ temps in the forecast thing. So, enjoy those cucumbers while they last. Remember Adam F1? There’s a seriously good chance that it’s been over-watered or it’s got bacterial wilt. But either way, it’s wilty and yellowing. It’s a pickle, isn’t it? 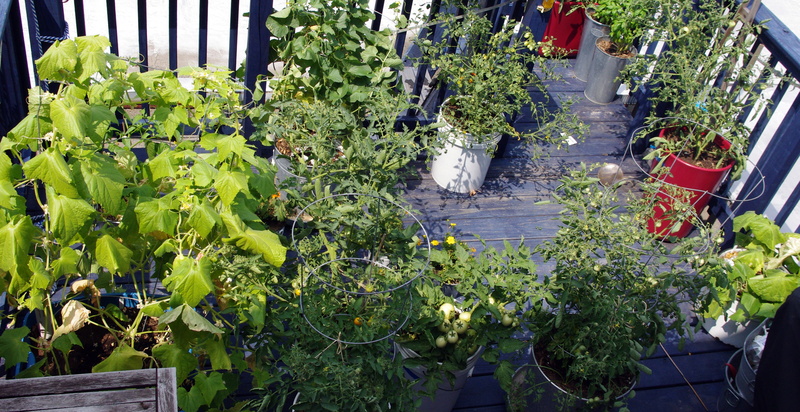 One waters to protect plants from the hideous heat. Both water and heat can kill…so, to water or not? It’s been a productive and delicious plant: 11 and counting. But POD fears its days are limited. And to think, these cucurbits were watered just seven hours ago. And that’s what 97 degrees plus a dark blue deck gets ya. Yes, everything got a second dose. 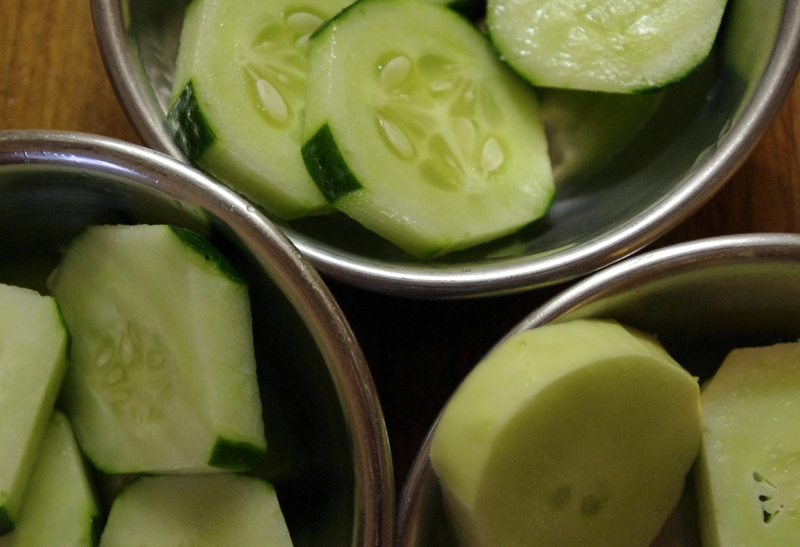 Cucumbers are here, dear readers! Any worries about planting three Spacemasters (pictured, top) to one 5-gallon(ish) tub have been allayed (for now). 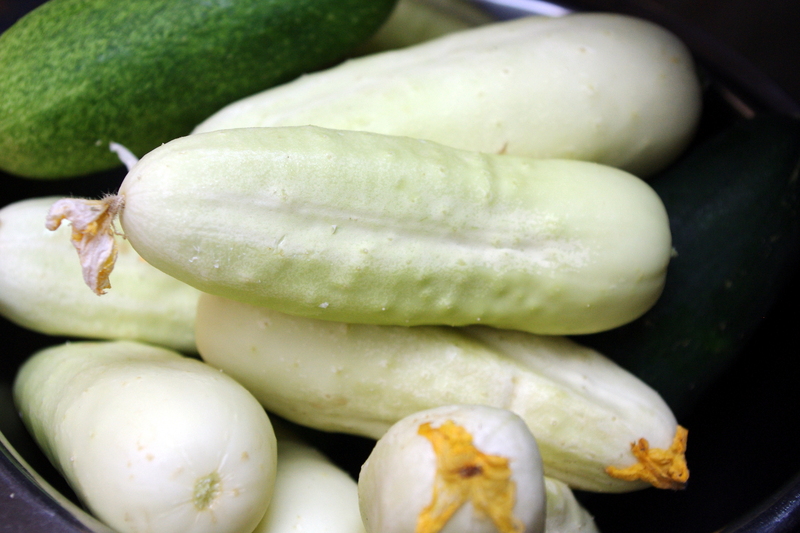 Several farmstand-worthy cukes have already been produced and several others are busy ripening. Burpee kindly included a packet of “free” White Wonder (pictured, lower right) heirloom seeds in POD’s ridiculously large seed order and they’re looking pretty darn good, too. 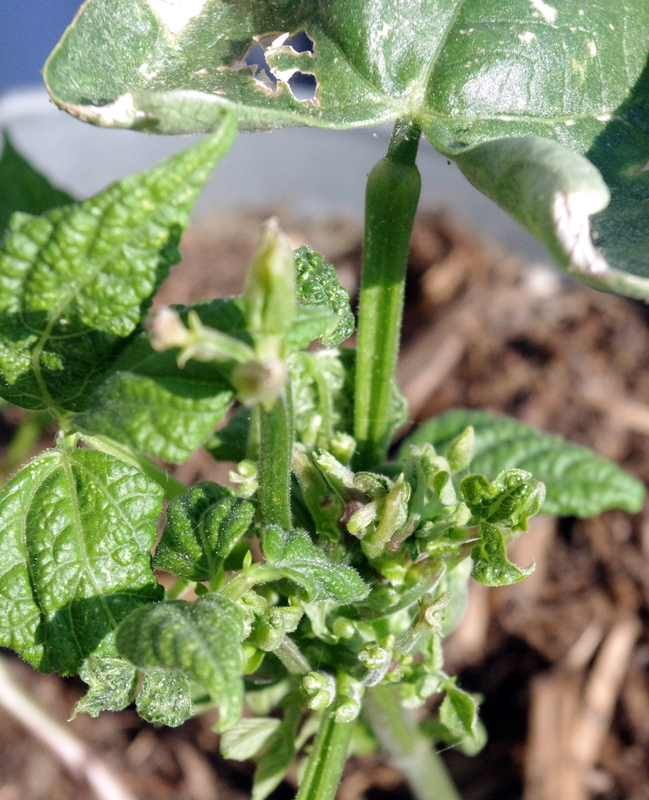 And finally, Seeds of Change’s Adam F-1 (pictured, left) is going nuts. Absolutely nuts. It seems to be the thirstiest of the bunch, but the sucker’s fruiting like bunnies. And so, a taste test is in order. The Spacemasters scream CUCUMBER — which is to stay, the dark, thick-skinned, 7-8″ fruits look and taste pretty much like those cucumbers you buy in the supermarket. Very good, but nothing particularly special. Better living through chemistry, it seems. The little 4″ Adam F-1 is juicy, citrusy, floral, and tastes like something way fancy. 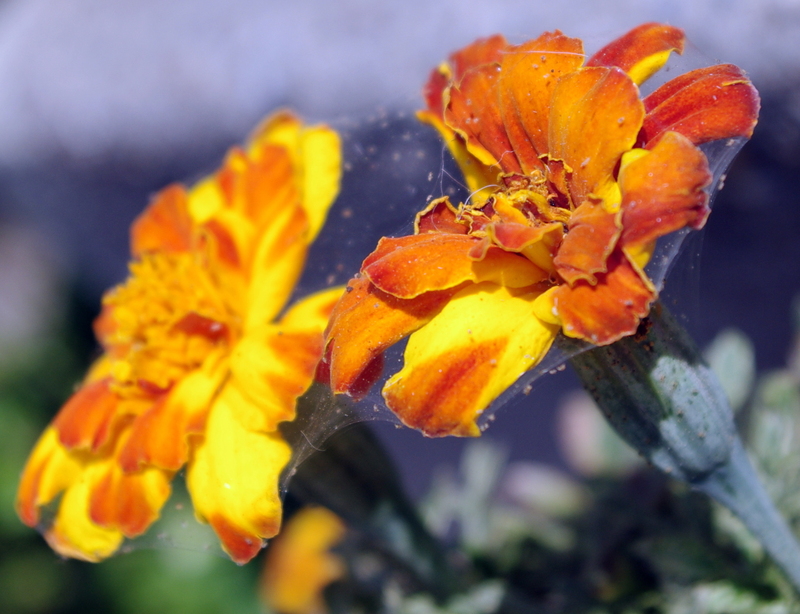 They’re not sweet-smelling or particularly pretty, marigolds. But they’re totally the new favorite flower here at plants on deck. These poor posies (which cost a whoppin’ 10¢ for four, thanks sales rack!) have been sacrificed to the garden gods, but their work here is done. Go trap crop marigold. May you rest in heroic peace and may your survivors ward off the evil aphid.